This is Addison's Walk, where Lewis and Tolkien walked together. So far between my pleasures are and few. This wide world holds; O love, my world is you. When life was sweet because you call'd them sweet? Ironically, the person whose absence is, as you may have guessed, prompting this thinly-disguised rash of posts about lost love and hopeless parting never, in fact, called my songs sweet, but quite the opposite, on several occasions; and vice versa, too. But this is a nice poem all the same. I went on holiday, and came back again, and this poem was stuck in my head all the time. And you companion'd, I am not alone. And thread the bridal dance with jocund pace. And you companion'd I am not alone. How should man be considered? Ase smoke in þe lift þat passet oure sith. As smoke in the air that fades from our sight. O God, the protector of all that trust in thee, without whom nothing is strong, nothing is holy; Increase and multiply upon us thy mercy; that, thou being our ruler and guide, we may so pass through things temporal, that we finally lose not the things eternal: Grant this, O heavenly Father, for Jesus Christ's sake our Lord. Amen. So I guess I'm just going to end up posting every single poem from Monna Innominata, one by one and in random order. Faithless and hopeless turning to the wall. Ready to spend and be spent for your sake. It's Isaac Watts' birthday today (he's 337 years old) and so here's a hymn by him. Out of the world’s wide wilderness. To make the young plantation grow. A gracious gale on plants beneath. And every grace be active here. With love and pleasure in His eyes. Sweeter than honey, milk, or wine. Demands more praise than tongues can give. And make his people one. When we arrive at home. From Pride and Prejudice, ch. 24. I wish I could be as wise as Jane! 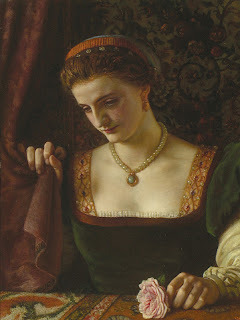 "Nay,'' said Elizabeth, "this is not fair. You wish to think all the world respectable, and are hurt if I speak ill of any body. I only want to think you perfect, and you set yourself against it. Do not be afraid of my running into any excess, of my encroaching on your privilege of universal good will. You need not. There are few people whom I really love, and still fewer of whom I think well. The more I see of the world, the more am I dissatisfied with it; and every day confirms my belief of the inconsistency of all human characters, and of the little dependence that can be placed on the appearance of either merit or sense." 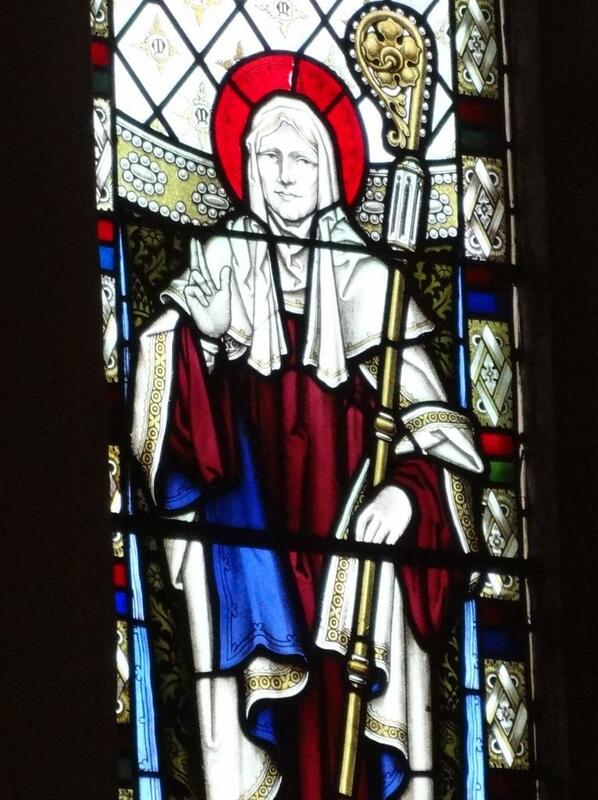 The saint in question, who is commemorated today, is Eadgyth (Edith) of Polesworth*, the sister of King Athelstan. When Athelstan came to the throne (c.925), the Anglo-Saxon kings of England ruled only as far north as the Humber: northern England was under the control of the Norse kings of Dublin, who had their capital at York. In 925 the Norse king was Sigtrygg, and Athelstan, in a bit of early-in-reign-alliance-establishing policy, arranged a marriage between his sister Edith and Sigtrygg. As part of this alliance, the pagan Sigtrygg agreed to accept Christianity and the overlordship of Athelstan, both in one go (this was how the descendants of Alfred did their best evangelising). 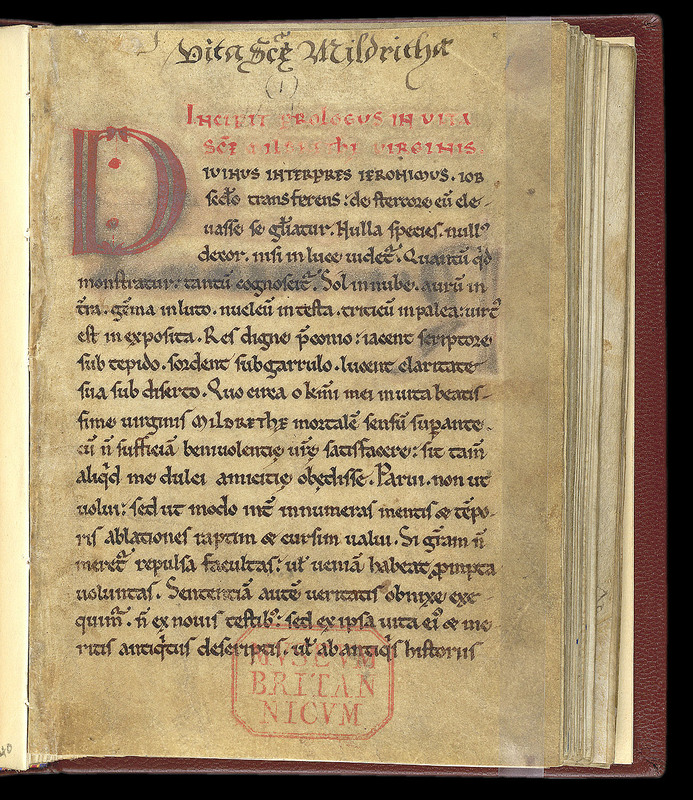 "Athelstan, king of the English, honourably married his sister Eathgitha to Sihtric, king of the Northumbrians, a man of Danish origin; who for love of the damsel renounced paganism and embraced the faith of Christ; but not long afterwards he repudiated the blessed virgin, and, abjuring Christianity, restored the worship of idols, and miserably ended his life shortly after his apostasy. The holy damsel thereupon, having preserved her virginity, abode at Pollesbury [Polesworth, Warwickshire], perserving in good works unto the end of her life, devoting herself to fasting and watching, alms-giving and prayer; and after a praiseworthy course of life she departed out of this world on the 15th of July at the same place, where unto this day [c.1230s] divine miracles cease not to be wrought." Sigtrygg indeed died in 927; whatever Edith's marriage to this pagan Viking might have been like, it was at least short. On his death Athelstan swooped and seized Northumbria, thus becoming the first ruler of (almost) all of England. Edith, if Roger's late account is to be trusted, went off and became a nun, and later saint. But she may just possibly have been the mother of Sigtrygg's son Óláfr (Roger's assertion that she "preserved her virginity" may just be a commonplace of hagiography; Anglo-Saxon royal saints from Ethelthyrth to Edward the Confessor were credited with celibate marriages). This Óláfr, who later also became king of Northumbria and Dublin, was probably the original for the Anglo-Danish legendary hero Havelok (at least for his name - they share the unusual nickname cuaran, 'sandal.'). As previously discussed, I like Havelok a lot. It seems rather appropriate that he may have been based on the product of a union between an English Christian princess and a Norse king who claimed descent from one of the scariest Vikings of all. Christina Rossetti, from Monna Innominata. "Did one but know", indeed! First touch of hand in hand - Did one but know! St Mildred of Thanet, "The Fairest Lily of the English"
13 July is the feast of St Mildred, Anglo-Saxon abbess and patron of the island of Thanet in Kent, where I was born. She was also the dedicatee of my first school and (oddly, for such an obscure saint) of one of my Oxford colleges, so I have to declare a personal interest in her. 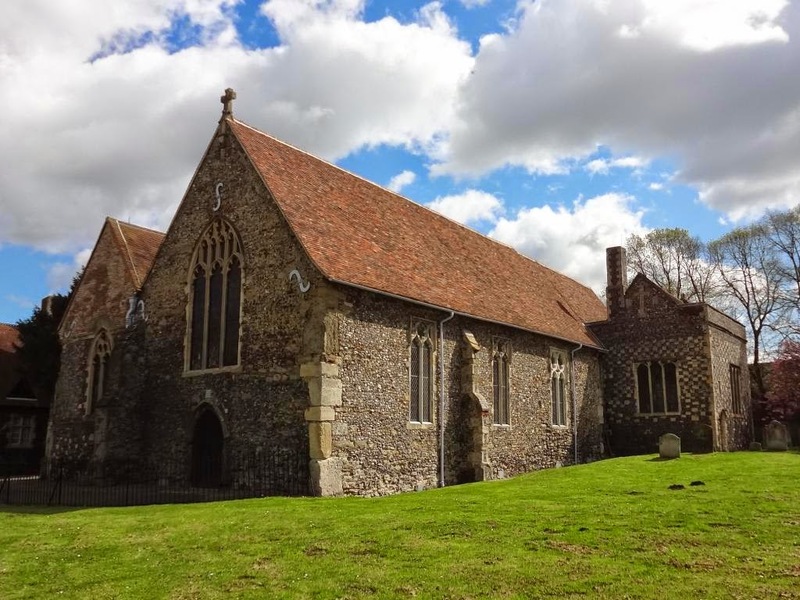 A daughter of the Kentish royal house, she lived around the end of the seventh and beginning of the eighth century, some 100 years after St Augustine brought Christianity to the coast of east Kent. 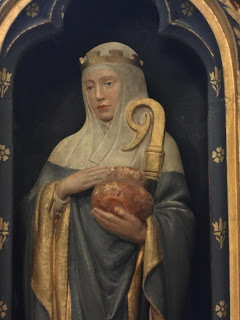 Mildred was the great-great-granddaughter of Ethelbert, the king of Kent whom Augustine encountered when he landed in England, and his wife Bertha. 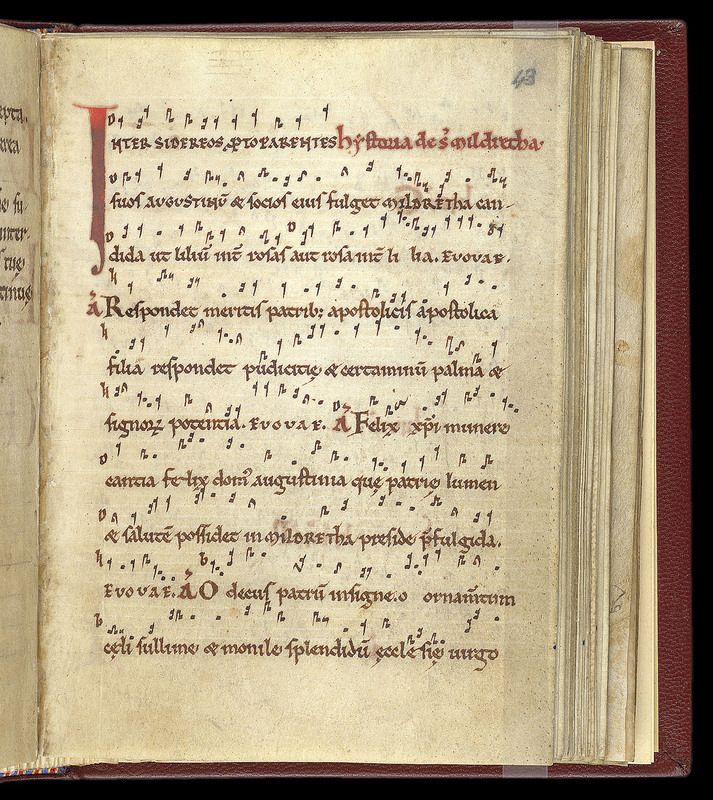 Ethelbert's great-granddaughter Æbba or Eormenburh, popularly known as Domne Eafe or Domneva, founded an abbey in 670 near the site of Augustine's landing in Thanet, at the place now called Minster (no prizes for guessing where that name came from). 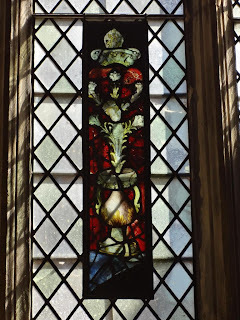 I've posted more on the wonderful origin-legend of the abbey, deer and blasphemers and royal murderers and all, here. 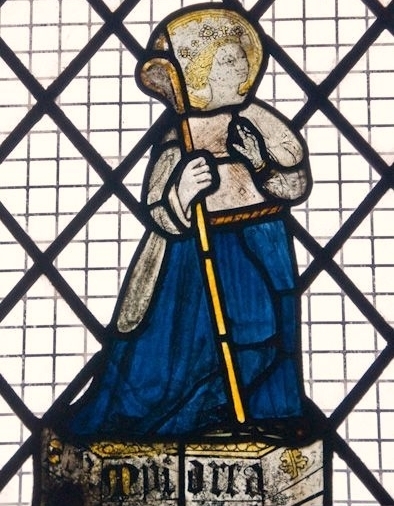 Before entering religious life at Minster Domne Eafe had been married to the king of Mercia, and had three children with him, including Mildred. Mildred was educated in France, supposedly became a nun to escape an unwanted marriage, and eventually became abbess of Minster after her mother. The surviving hagiographical sources for her life are late ones (from the eleventh century onwards), but they say that she was known for her holiness, wisdom and generosity to the poor, and after her death in c.733 she was soon regarded as a saint; her successor as abbess, St Eadburh, built a church at Minster to enshrine her relics and support her growing community. [Domne Eafe] hyre leofe bearn georne lærde, and to Gode tihte. Wæs hit hyre eac eaðdæde, swa lange swa hyre ingehyd wæs eal mid Godes gaste afylled. Næs heo swa nu æðelborene men synt, mid ofermettum afylled, ne mid woruldprydum, ne mid nyðum, ne mid æfeste, ne mid teonwordum; næs heo sacful, ne geflitgeorn; næs heo swicol nanum þæra þe hyre to ðohte. Heo wæs wuduwena and steopcilda arigend, and ealra earmra and geswincendra frefiend, and on eallum þingum eaðmod and stille. M. J. Swanton, 'A Fragmentary Life of St. Mildred and Other Kentish Royal Saints', Archæologia Cantiana xci (1975), 15-27 (26). [Domne Eafe] gladly taught her dear child and led her to God. And that was an easy thing for her to do, because her mind was entirely filled with the spirit of God. She was not, as nobly-born people are now, filled with arrogance, or with worldly pride, or with malice, or with envy, or with angry words; she was not quarrelsome or quick to argue; she was not false to those who looked to her. She was a protector of widows and orphans, and comforter of all the poor and afflicted, and in all things she was humble and gentle. The very last word here, stille, is an interesting word to describe her - it's not commonly used for people, I think. It's almost synonymous with mild, the first element of Mildred's name, but with an added suggestion of quietness or stillness. 'Mild' today has unfortunate overtones of weakness, perhaps of excessive softness, but the Old English word doesn't - it's a thoroughly regal word, its sense something like 'gentle, kindly, moderate' and (when applied to rulers or to God) 'merciful, gracious'. Mildred's full name (Mildþryð) means 'gentle strength' - as Etheldreda, Æþelðryþ, means 'noble strength' - and it's not supposed to be an oxymoron. 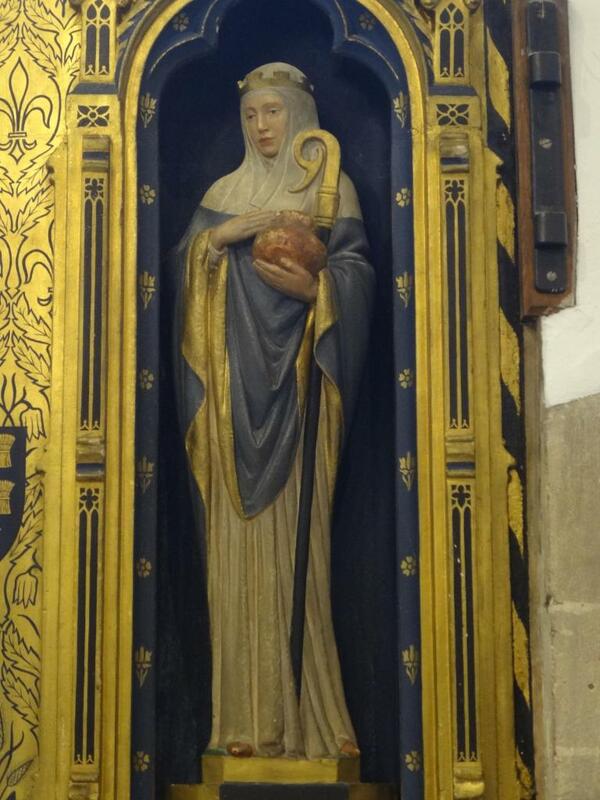 Mildred is Thanet's only saint, and she seems to have been genuinely popular in the area; even operating in the same general sphere as the much more glorious St Augustine, she managed to outshine him. 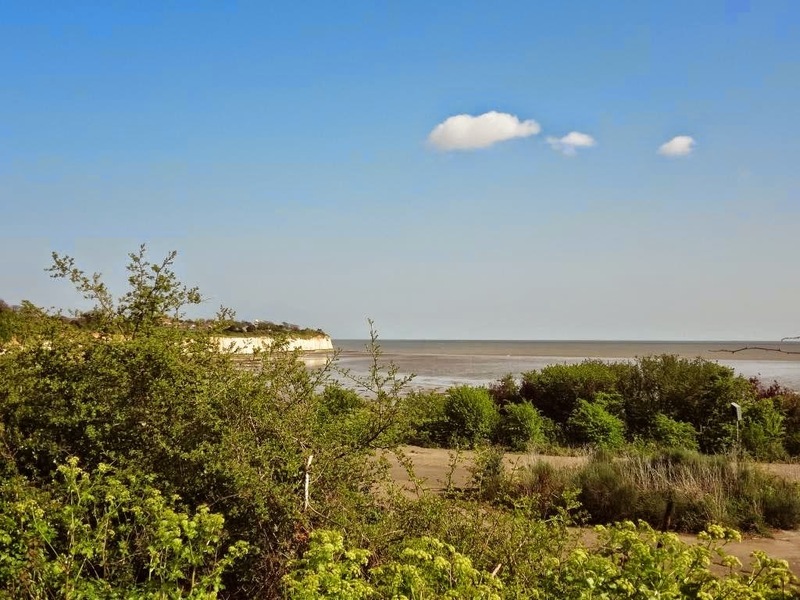 For instance, legend said when she returned to Thanet from France to join her mother's nunnery, she landed at Ebbsfleet (the same place Augustine had landed - that's the ancient Ebbsfleet and not the modern one) and left the print of her foot permanently in the rock where she disembarked. That rock was considered a relic and kept in its own chapel, where miracles of healing took place. Mildred's abbey at Minster was refounded on the same site in 1937 by a community of nuns leaving Nazi Germany, and it's still going strong, in one of the oldest inhabited buildings in England. To have survived both Vikings and Nazis demonstrates 'gentle strength' of an extraordinary kind. 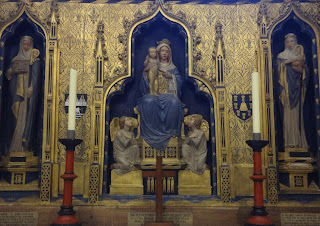 This picture and the one at the very top are of the parish church at Minster; for images of Minster Abbey, see their website or this post. 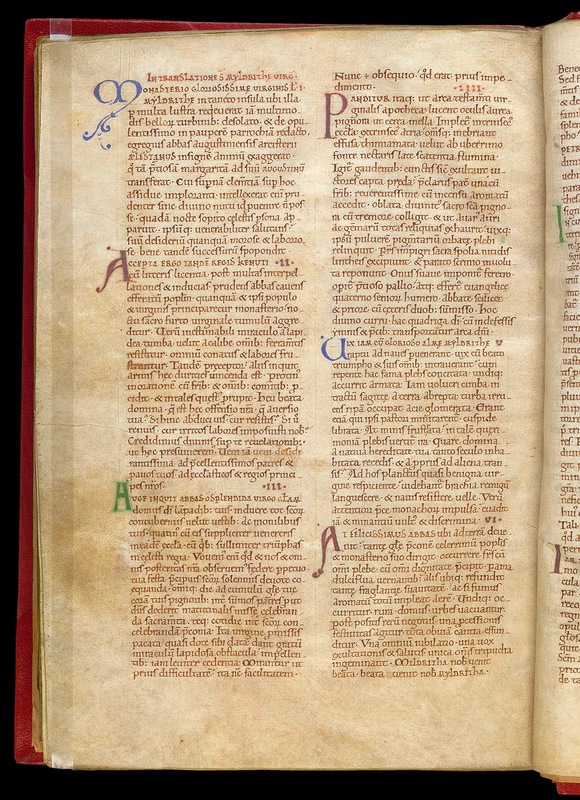 Goscelin also attributes some interesting miracle-stories to St Mildred, including one which says that in c.1043, just after Edward the Confessor came to the throne, Mildred defended and protected Edward's mother Queen Emma when the king stripped her of her wealth - in retribution (this story claims) for her support of a Norwegian invasion led by Magnus the Good against her own son. This story is hard to verify but it might possibly be an intriguing little insight into the complicated Anglo-Norman-Scandinavian politics of the 1040s - or it might not. Either way, it shows Mildred taking the part of a royal woman like herself against an act of cruelty from the king (which did actually happen, as recorded in the Anglo-Saxon Chronicle for 1043), a kind of solidarity across three centuries. 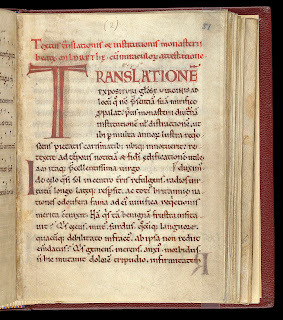 The Latin text can be found here. 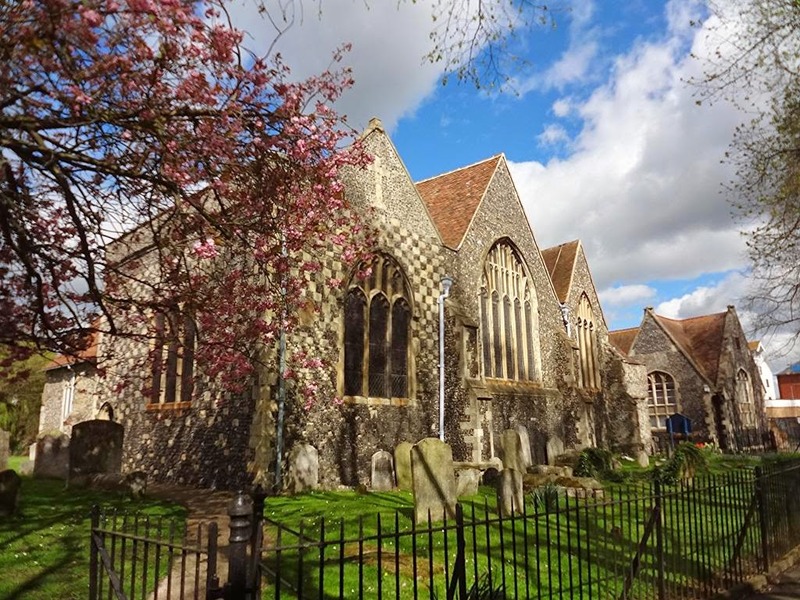 It tells us that among the saints of St Augustine's, 'Fulget Mildretha candida ut lilium inter rosas aut rosa inter lilia', 'Mildred shines white as a lily among roses, as a rose among lilies...' She is 'pearl of the Mercians, Canterbury's crown, the star of all England'. 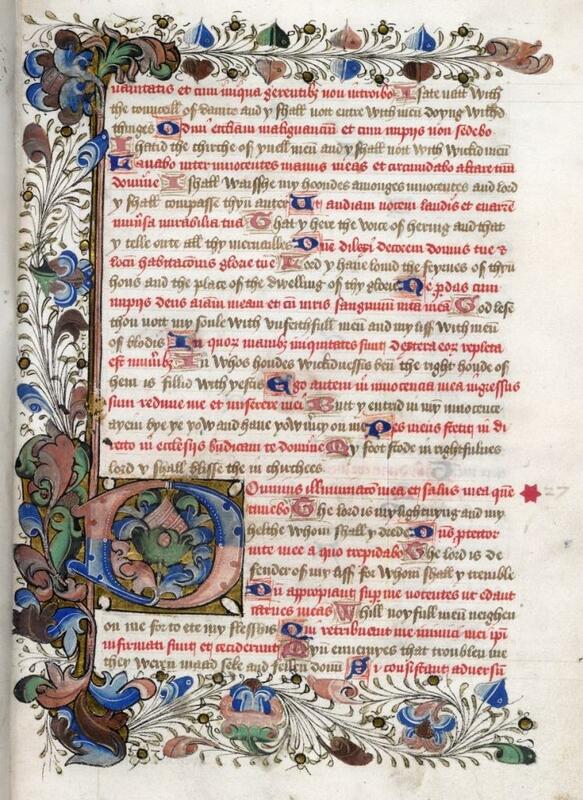 (There are more manuscripts of these texts, of which I don't have images.) 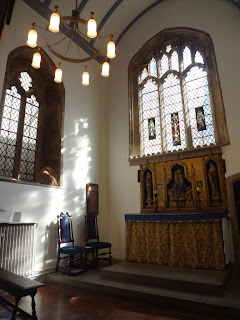 What you're seeing here is evidence of Mildred's importance to St Augustine's in the eleventh and twelfth centuries - among that monastery's plethora of saints, an illustrious roll-call of Italian missionaries, archbishops and kings, this Kentish nun held an honoured place. The things which look like fighter jets are actually geese, with which St Mildred (like other female saints, including St Werburgh) is particularly associated. Such iconography had not even been thought of when Mildred lived, or when Goscelin wrote, but it's a felicitous chance. Life is full of such coincidences. St Mildred's story was probably the first bit of Anglo-Saxon literature I ever learned, aged five or six, long before I knew what 'Anglo-Saxon' meant, but it was nothing more than coincidence which subsequently brought me to study at Lincoln College, on the ground where St Mildred's church stood; I didn't even know of Mildred's connection with the college until that Ascension Day in 2009, when I had been there two years already. She later found her way, quite by accident, into my doctoral thesis, for Cnut-related reasons. I thought I had left St Mildred behind me in Thanet, the only place where people have really heard of her; but she was here before me, and as it turned out, some of the happiest times of my life have been spent in the little island of enclosure between Turl Street and Radcliffe Square, bounded on the north by what was once St Mildred's Lane. I love verse two of this hymn, which is by Frederick Lucian Hosmer (1840-1929). The slow watches of the night, and weary days, and long times of waiting... all belong as much to God as the kingdom that will come. on earth that kingdom's day. the silent stars are strong. the promised day of God. Tennyson's poem 'Home they brought her warrior dead', which he published as one of the many short verses in The Princess, was loosely based on (a translation of) an Old Norse poem known as Guðrúnarkviða I. I've posted about this poem before, but here's some more of it; I'd forgotten how wonderful it is. né kveina um sem konur aðrar. svá var hon móðug, mundi hon springa. or lament like other women. she was so fierce in her grief, she could have burst apart. ok harðhuguð of hrör fylkis. and so heavy in heart for the fall of the prince. 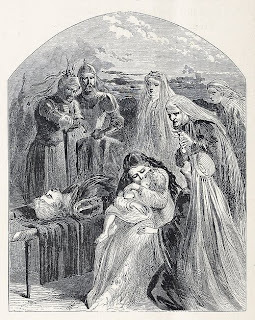 At last her sister, seeing more keenly how to pierce Guðrún's impassive grief, pulls the covering away from Sigurðr's body, and shows Guðrún his hair streaming with blood, his eyes grown dim, the wound in his breast - and at last she can weep. en regns dropi rann niðr of kné. and drops like rain ran down her knee. systir mín nema hjá Sigurði." my sister, except with Sigurðr. oft í jölstrum at jöfur dauðan. ok systur sinnar sárum gráti. a precious stone among the princes. among the bay-willows, because of the death of the prince. my talking-friend; the kin of Gjúki caused this. the sore weeping of their sister. She goes on to curse her brothers to misery and is upbraided by Brynhildr, who then kills herself because she can't bear to live without Sigurðr. Yet she neither spoke nor moved. Yet she neither moved nor wept. I confess to a fondness for verse two. But really, you would think that the author of In Memoriam, the Victorian poet of grief par excellence, could have come up with something a little more heartfelt, a little more true. In this one, the Old Norse poet beats the Poet Laureate hollow. Nor wailed with the other women, and the daughters of the land. With the deadly chill of sorrow that none may bear and live. Of the woes of living man-folk and the daughters of the Kings! When men are hushed to hearken the least of all my words. Save to wear down lamentation, and make all sorrow nought?" For the love they had taken from her, and the day with naught to do. "Yet all we live to love thee, and the glory of the Queen. If the Queens of men shall tremble, and the God-kin faint and fail?" Because of her love departed, and the day with naught to do. Save the hope of the Niblung masters and the sorrow of a foe." 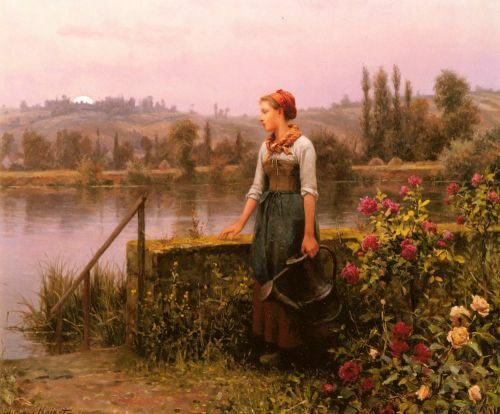 Since her love was taken from her and the day of deeds to do. Hast thou spoken a word to the dead, and known them hear and behold? E'en so is this word thou speakest, and the counsel of thy face." Let his face by thy face be cherished, and thy lips on his lips be set!" For now was the day's best hour, and its loveliest tide begun. And the King is lit with its glory, and the people wonder and praise. — O people, Ah thy craving for the least of my Sigurd's days! Thou striver, thou deliverer, thou hope of things to be! And was praised for the loftiest woman and the best of Odin's pride! When the winter wood is shaken and the sky by the North is cleft." Then her speech grew wordless wailing, and no man her meaning knew. Morris wonderfully conveys the incredible power of Guðrún's grief, which is such a memorable part of the Norse legend. 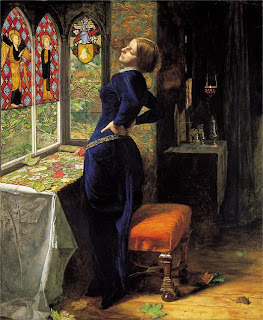 It is a 'mighty grief', in Morris' phrase; it is overpowering, unmanageable, and beyond speech. That's what so moving about the story - that her grief has completely immobilised and silenced her. Pitched past pitch of grief, she can't grieve - she can't speak or give words to her sorrow. And for Guðrún, as for women generally in Germanic legend, silence is stasis, speech is action; speech does things. Silent, she is helpless; speaking, she begins to control her grief. All the women who recount their stories of sorrow, attempting to spark a cathartic response in catatonic Gudrun, depict (as Morris' poem reflects, and Tennyson's really doesn't) a collective experiencing of grief, which mirrors the cathartic effect of listening to a fictional story like Gudrun's. 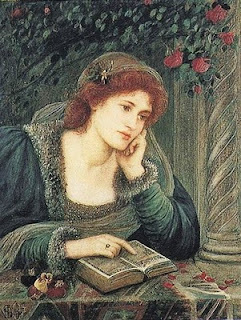 That's part of the power of it - that your own sorrow, whatever it is which has most wounded you, the reader, could be one of the stories the women tell. I'm in a Tennyson mood at the moment, and this has always been one of my favourites. Or from the crevice peer'd about. Oh God, that I were dead!" Psalm 27 is appointed for the fifth evening of the month, and so here are some various translations of it. This is one of my favourite psalms and, as I've said before, the source of the motto of the University of Oxford, so it seems a fitting place to start an occasional mini series on medieval psalm translations. and though there rose up war against me, yet will I put my trust in him. even that I may dwell in the house of the Lord all the days of my life, to behold the fair beauty of the Lord, and to visit his temple. yea, in the secret place of his dwelling shall he hide me, and set me up upon a rock of stone. above mine enemies round about me. : I will sing, and speak praises unto the Lord. have mercy upon me, and hear me. nor cast thy servant away in displeasure. leave me not, neither forsake me, O God of my salvation. the Lord taketh me up. and lead me in the right way, because of mine enemies. for there are false witnesses risen up against me, and such as speak wrong. but that I believe verily to see the goodness of the Lord in the land of the living. be strong, and he shall comfort thine heart; and put thou thy trust in the Lord. 1. The Lord is my liytnyng, and myn helthe; whom schal Y drede? The Lord is defendere of my lijf; for whom schal Y tremble? 2. The while noiful men neiyen on me; for to ete my fleischis. Myn enemyes, that trobliden me; thei weren maad sijk and felden doun. 3. 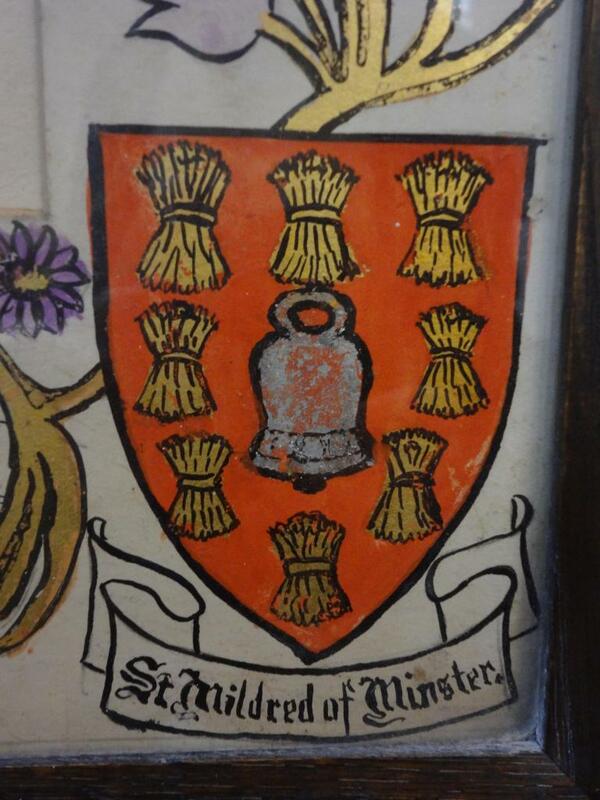 Thouy castels stonden togidere ayens me; myn herte schal not drede. 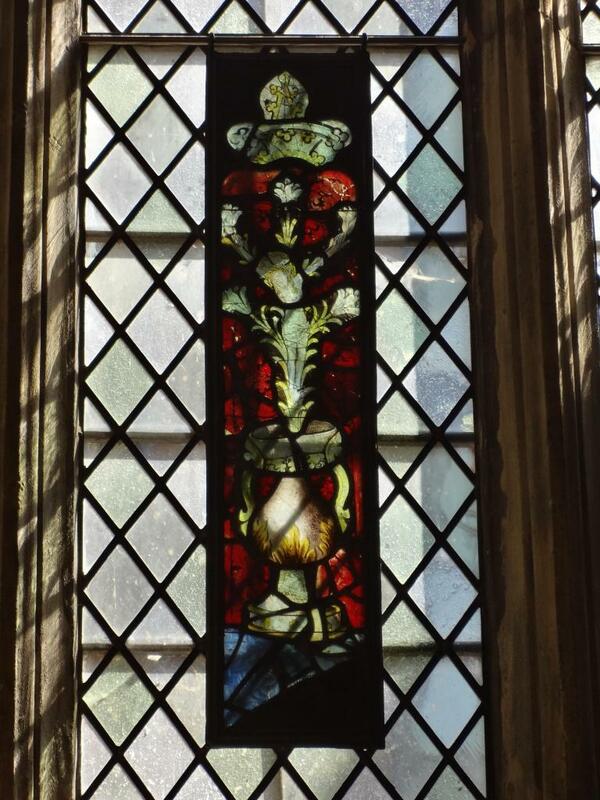 Thouy batel risith ayens me; in this thing Y schal haue hope. 4. I axide of the Lord o thing; Y schal seke this thing; that Y dwelle in the hows of the Lord alle the daies of my lijf. That Y se the wille of the Lord; and that Y visite his temple. 5. For he hidde me in his tabernacle in the dai of yuelis; he defendide me in the hid place of his tabernacle. 6. He enhaunside me in a stoon; and now he enhaunside myn heed ouer myn enemyes. 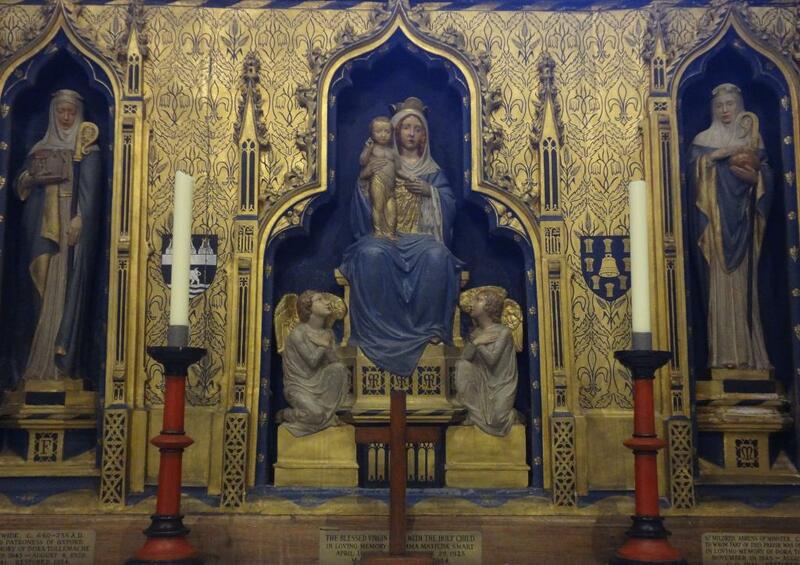 I cumpasside, and offride in his tabernacle a sacrifice of criyng; Y schal synge, and Y schal seie salm to the Lord. 7. Lord, here thou my vois, bi which Y criede to thee; haue thou merci on me, and here me. 8. Myn herte seide to thee, My face souyte thee; Lord, Y schal seke eft thi face. 9. Turne thou not awei thi face fro me; bouwe thou not awei in ire fro thi seruaunt. Lord, be thou myn helpere, forsake thou not me; and, God, myn helthe, dispise thou not me. 10. For my fadir and my modir han forsake me; but the Lord hath take me. 11. Lord, sette thou a lawe to me in thi weie; and dresse thou me in thi path for myn enemyes. 12. Bitake thou not me in to the soules of hem, that troblen me; for wickid witnessis han rise ayens me, and wickydnesse liede to it silf. 13. I bileue to see the goodis of the Lord; in the lond of `hem that lyuen. 14. Abide thou the Lord, do thou manli; and thin herte be coumfortid, and suffre thou the Lord. 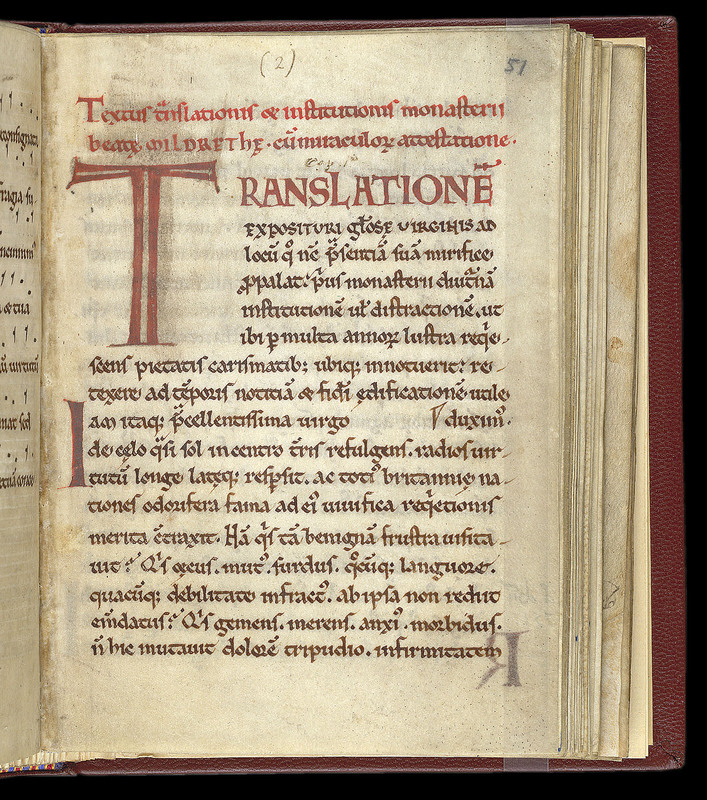 The next translation is a metrical version, earlier than the Wycliffite Bible by about a century, and from Yorkshire. 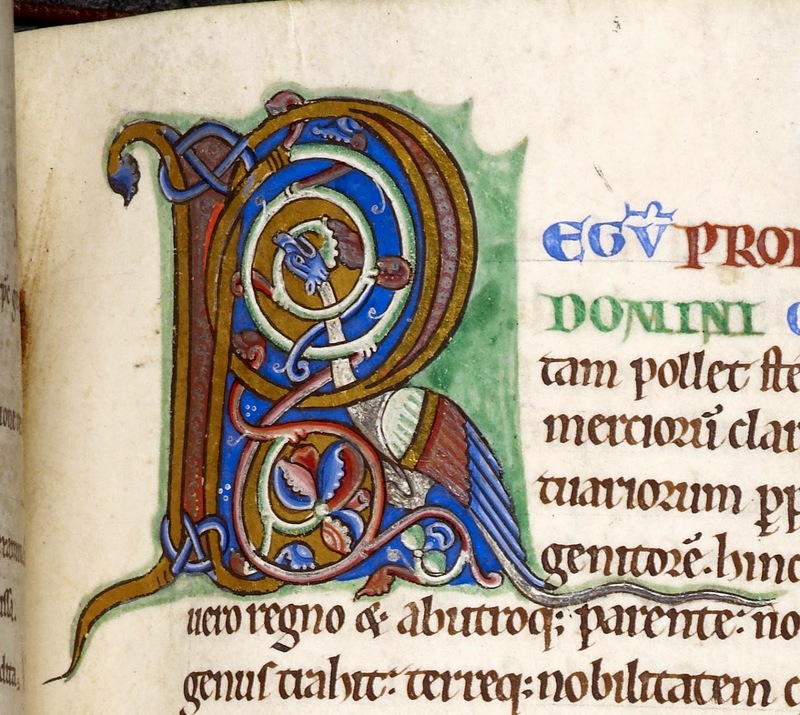 It's from the Surtees Psalter, which is online here. If you want to read it in a Yorkshire accent, that would probably help. And mi hele; wham i sal drede? For whate sal [i] quake, swerde or knife? 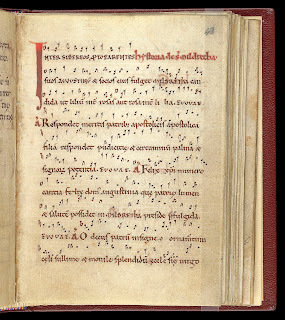 Þai are vnfeste and felle sare. In þat sal i hope in mighte. And seke his kirke in forto ga.
And nou heghed mi heued ouer mi fane. And salme to lauerd sal i saie. Hafe merci ofe me, and here me. I sal seke, lauerd, to face þine”. Ne helde in wreth fra þi hine swa. Ne me forse, god mi hele swete. Lauerd sothlike vptoke me ai. And right me in right stiyhe, for faes myne. And leghed to þam þair wickenes. In þe land ofe liuande be. And strenþhed be þi hert, and lauerd vphald þou. Who shall be able me to fright? In land with living creatures clad? I associate this passage with Compline, where it's one of the regular readings - a dark chapel, candlelight, and stillness - and also with this hymn. It's by William Chatterton Dix (1837-1898), who wrote one of my favourite Christmas carols, 'As with gladness men of old'. It's not, to be honest, particularly inspired, but there's no turning that Gospel passage into anything less than beauty. Which comes to hearts oppressed! Of love which cannot cease. And I will give you light." Which comes to cheer the night! And songs the break of day. And I will give you life." Which comes to end our strife! And stronger than the strong. I will not cast him out." To come, dear Lord, to Thee!